If you are looking to auction, buy, consign in our Elvis Presley Worn Costume Auction, please email Nate@natedsanders.com or call (310) 440-2982. NateDSanders.com is proud to announce a 2017 Elvis Presley worn costume auction. Elvis Presley costumes including jump suits and jackets can sell for as much as $100,000 each. Even lower price Elvis Presley memorabilia sells well. Here are two prices realized from our last Elvis Presley worn costume auction. 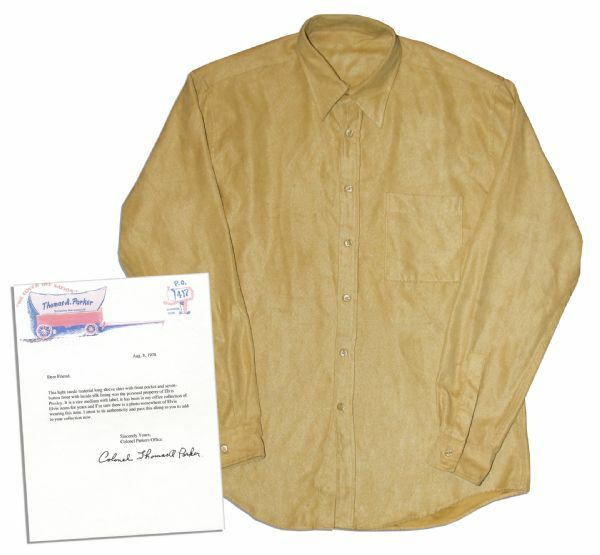 Elvis Presley owned and worn camel-colored suede shirt, with letter of authenticity from his long-time manager Colonel Tom Parker, dated 8 August 1978. Letter written on Parker’s personal stationery reads in full: ”Dear Friend, This light suede material long sleeve shirt with front pocket and seven-button front with inside silk lining was the personal property of Elvis Presley. It is a size medium with label, it has been in my office collection of Elvis items for years and I’m sure there is a photo somewhere of Elvis wearing this item. I attest to its authenticity and pass this along to you to add to your collection now.” Signed ”Colonel Thomas A. Parker” in black ink. Fine condition. From our last Elvis Presley worn costume auction. Sold for $4,570. Elvis Presley worn riding jacket. Caramel suede jacket was custom made for The King by Mike McGregor who resided at Graceland, and worn riding horses on the famed estate. Jacket features contrasting chocolate brown oversize leather stitching and four-button placket. Measures 20.5” across the chest. 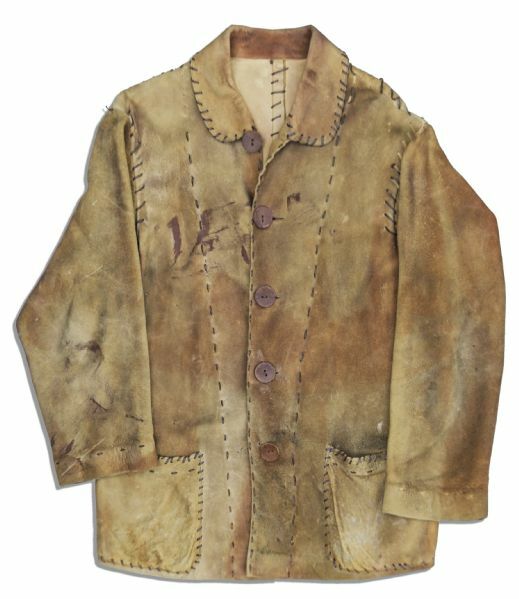 Scattered brick red paint stains, irregular bottom edge and absent lacing to left cuff, with some breakage to leather laces on the pockets and tops of the shoulders, else near fine. With an LOA from the son of ”Blue Suede Shoes” songwriter Carl Perkins, to whom the jacket was gifted by McGregor after Elvis’ death. From our last Elvis Presley worn costume auction. Sold for $3,781. Golden Globe award for ”Elvis on Tour”, Elvis’ final film, shot in 1972. The Hollywood Foreign Press Association presented this award for Best Documentary Film at the 1973 ceremony at the Beverly Hilton Hotel in Los Angeles. The MGM film was a musical documentary directed by Robert Abel and Pierre Adidge. It provided a behind-the-scenes perspective on Elvis on a 15-city U.S. tour, as well as footage from his legendary live performances. Statue is composed of a metal sculpture of a globe encircled by a film strip upon a decorative base mounted to a marble pedestal. The letters ”HFPA” appear in the metal design beneath the globe. An engraved plaque is mounted to the marble pedestal. Measures 8.5” in height. Square base measures 3” x 3”. Flaking to gilt finish at the bottom of the figure and small shallow chip to base edge. Weighs 4 lbs., 5 oz. With an LOA from Robert Abel’s daughter. A lot in our Elvis Presley worn costume auction. Sold for $10,000.